The AFP ICON 2019 App Is Here! It's Here! The AFP ICON 2019 App! Learn More & Register Now For AFP ICON 2019! It's Here! AFP ICON 2019 - Your Free Conference App for San Antonio! No need to worry about wi-fi connections while you are roaming deep into the nooks and crannies of San Antonio’s Henry B. González Convention Center! Just download the free AFP International Conference on Fundraising app - AFP ICON 2019 (brought to you by CrowdRise by GoFundMe)- for your iPhone, iPad, Android or BlackBerry, enter your email and set up your profile, and you are set for conference! Have all the sessions, speakers, exhibitors, and more at your fingertips, and create your own personalized conference experience! Best of all, the free AFP ICON 2019 app will perform optimally whether or not there's an Internet connection. When connected, the app downloads updates (like a schedule or room change), and also allows the user to set up a profile, connect with fellow attendees, post status updates and pictures to the activity feed and social media, and more! Once downloaded, all of the data is stored locally on the device so it's accessible even if there's no Wi-Fi! Make the AFPeeps proud! Simply search "AFP ICON 2019" in iTunes and Google Play, or click the image (or link) below to start your free AFP ICON 2019 app experience! Don't miss the fun—download the app and set up your profile now! Special thanks to CrowdRise by GoFundMe for being our AFP ICON 2019 app sponsor! Don’t miss this. 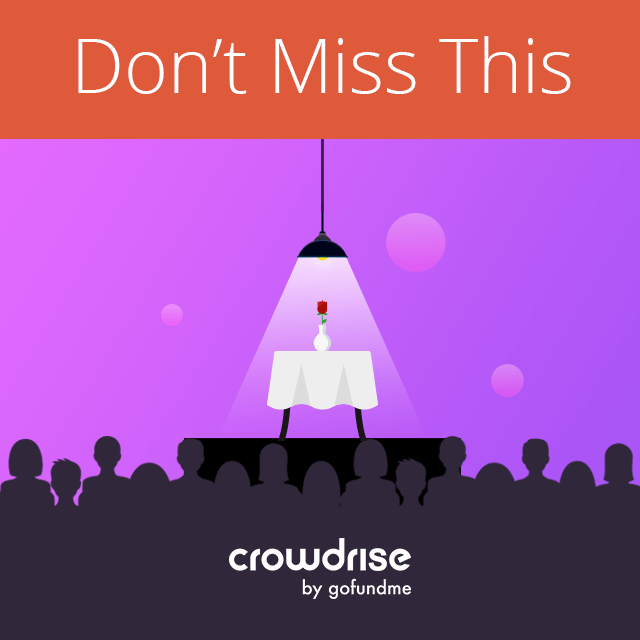 The most entertaining product tour ever - An intimate dinner with CrowdRise by GoFundMe. Monday, 9:15 am, Learning Lab 2. Learn more! Tech Support: If you can't get the application running on your smartphone, or have any other questions, email the application developer, DoubleDutch, at customersupport@doubledutch.me. Please note: Certain Android users may not see the AFP header logo appear on their devices, while Blackberry and other HTML5 users may find limitations with the photo upload feature. AFP ICON 2019 is the official interactive mobile app for the 2019 International Conference on Fundraising , March 31 - April 2, 2019, in San Antonio, Tx.! Prepare to rev up your fundraising game! After downloading, you will be asked to select an email to access the app. You will then receive an automatic email to the address you entered containing a password for your app account. You can keep this password and use it anytime you need to log back into the app. Or you can select a new password if you'd like by clicking the "Reset Password" button on the the login screen of the app. Chat Channels! - What to know where to get the best BBQ in San Antonio? Need an exercise buddy? New and slightly overwhelmed by the whole conference thing? Looking for others from your state or chapter to meet up? Chat away on our special conference channels and ramp up your all-around ICON experience! My Direct Messages - Keep tabs on all your private messages with fellow attendees in one place! My Schedule - View the full education and event schedule and information, and quickly set up your personalized calendar simply by adding sessions to your agenda. You can also filter events and sessions by Education Track and Experience Level! Speakers & Exhibitors - See speaker pictures and bios, and see what the conference exhibitors have to offer! Handouts - Quickly access all the session PDF handouts at the conference, attached to each session! Conference is not all work—there's plenty of play to be had in San Antonio! And the app experience is no different. Each time you access the app and take certain activities, you will earn points, whether it be posting to the live feed, checking into sessions, adding photos to the stream, commenting on other attendees' posts and check-ins, and more! Every action is worth different points (and these may change on a random basis)—can you figure out what earns you the most points on a particular day? See how many points you've gained and where you stand in comparison to other attendees by clicking the "App Leaderboard" link in the main menu! You can also earn special badges for your check-ins, posts and picture uploads! Badges are hidden until "unlocked" through completion of a certain action—and the more your do it, the more badges you may collect! To see what badges you have earned, simply go into your Profile and click About (bottom left)! 1. The AFP Leaderboard Challenge! Are you the Leader of the Pack? Get ready—we will once again have The AFP Leaderboard Challenge during conference! This is a simple points accumulation game using the features of the app. The more you use it and do things such as posting to the live feed, checking into sessions, adding photos to the stream, commenting on other attendees' posts and check-ins, etc., the more points you earn. Be sure to check the "App Points Leaders" link to see the standings. You can also check out the live GameDay feed that will be up at the AFPeeps Nest to see what's happening and who's in the lead! At the end of the conference, the top 15 points-getters will be entered into a drawing for not just Cool Points, but actual Cool Prizes! Please Note: The AFP Leaderboard Challenge will officially begin at 8 am CST Friday (March 29) and conclude at 5:00 pm CST Tuesday (April 2)! What does that mean? Simply that while you may (and are encouraged to!) participate and post pictures and comments on the app leading up to (and after) that timeframe, there will be no points awarded for these actions (only initial points for setting up your app profile). The points system will be turned on at the exact "start" of the pre-conference workshops at 8 am CST Friday March 29, and be turned off at the end of conference at 5:00 pm CST on Tuesday, April 2. This is to give everyone a fighting chance to be in the Top 15! "BUT WAIT ... WHAT ABOUT MEEEEEE?! I actually have responsibilities at conference other than playing on the app all day, you know .... sheesh!" First—seriously? Get your priorities straight! OK, we hear you! And we know when some of you do join in and post to the Live Activity Feed or comment, people listen (eat your heart out, E.F. Hutton) and you really enhance the experience for all! So in addition to the Top 15 points-getters, the AFPeeps and AFP staff will also be selecting an additional 5 app users at the end of conference to enter into the drawing based solely on the quality of their postings and engagement with the app community. Points smoints - if you're good, you're good, and we'll notice! Power to the (more) Peep-le! We'll also be increasing the prize count to 20, so everyone in the drawing will wind up with something! Again, we will announce the Top 15 points-getters and the 5 Power Peeps once conference closes, with the drawing soon after. Winners will then be notified and announced. 2. Special ACFRE Badges - ALL NEW FOR 2019! Yep - those big-medallion modeling ACFREs (so flashy!) will again be wandering around conference, just begging you to take a picture with them! This year, they are keeping you on your toes - and educating you! - with a twist on the usual fun! Each of these special stickers has a corresponding badge in the AFP ICON 2019 app! - Post it to the app with the hashtag on the sticker, making sure (this is important!) to also "check in" to that special hashtag session (they will have the same name as the hashtag, so for example, the first session in the app is called "#ACFREselfie1 Special Session"
This will unlock your special ACFRE badge for that sticker selfie! Even better - once you check in and unlock all 5 special ACFRE sticker badges, you will automatically earn and unlock your special 6th badge! Pretty awesome, right?! Get ready to get to sussing out those amazing ACFREs! 3. Fun Badges Announced for AFP ICON 2019! Things just got a little crazy up in the AFP conference app—8 Special Super San Antonio badges have been created for you to earn and unlock! What do they look like? You're gonna have make some effort to see them! Check 'em out below, and plan your #afpicon experience accordingly! Happy hunting, partner! To see the badges you have unlocked, go into your Profile, then click the About link at bottom left. Please note: These badges cannot be unlocked until the events noted actually take place ... so no - you can't be sneaky and check in to them beforehand! The Super-Duperist of our Special Super San Antonio badges! Only C-APPtain Marvel can vanquish evildoers without breaking a sweat - just like you can conquer so many education offerings in just three days! Check into 15 (or more!) AFP conference education sessions and earn your C-APPtain Marvel badge! Or is it APP-Man (ok, ok, - I'll stop ... the app puns are killing me, too). Yes, Antman may be a little on the petite side, but that just means he brings a little extra special something to the dance - just like our Conference Welcome Reception & Networking event on Saturday night! Come by, check in and get your little yet mighty Antman badge! Can I do one more? No? Too bad! Biff! Bam! Pow! - the B-APPman badge awaits those who head out into the Gotham night and take on the ¡Viva Fiesta! conference party co-hosted by super sidekicks AFP San Antonio and AFP Global! Swing into action and check into the party at the Briscoe Western Art Museum to unlock your Batman badge! What - really, I can't? But I can do it twice! Look - Bl-APP P-APPther ... ok, that's horrible - I'll show myself out. Black Panther's home of Wakanda is the center of enlightenment - just like the AFP General Sessions are central to your conference experience. Be sure to check into a General Session and shout "Wakanda Forever!" when you unlock your badge! Just as Peter Parker or Miles Morales slash though tangled webs of evil to make NYC a safer place, so too do the AFPeeps - untangling that mysterious world wide web to better enlighten the fundraising world! Unleash your tingly Spidey sense by checking into five (or more!) AFPeep U sessions at Learning Lab 1! My personal favorite (no, I didn't have a crush on a comic book character - you did!) - Wanda has the ability to influence and shape your reality … just as the vendors in the AFP Marketplace know exactly what you need to enhance your fundraising reality! Check in at five (or more) exhibitors & earn The Scarlet Witch badge! Logan definitely marches to his own beat while battling alongside the X-Men, bringing something special and fun to the fight ... just like our amazing selection of special conference events! Check into two (or more!) AFP special events and unlock the Wolverine badge, Bub! A tight-knit collection of different and diverse heroes and characters that are greater than their sum. No better way to also describe AFP's Community Groups! Assemble and network at our Community Group receptions on Sunday night - check into two receptions to unlock The Avengers badge! In addition to the Fun Badges noted above, you can also unlock the following "activity" badges on your phone each time you take basic actions on the app, such as setting up your profile, checking into events and sessions, and posting pictures. The more you do, the more badges you collect! Enjoy the AFP ICON 2019 App and Have a Great Conference Experience!